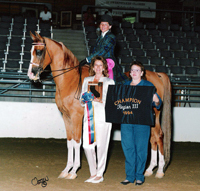 “ET” is still alive as at 32 in 2013 and a shining example of why we love Arabian geldings. Teaching two families and three sets of young ladies how to ride and win/lose over twenty years of competition, he’s a saint of a horse and continues to be loved. This entry was posted in Champions, Heritage on October 15, 2013 by Anita Enander.